Hundreds of Syrian refugees left Lebanon on Monday for their neighbouring home country, an AFP reporter said, the latest such return coordinated between Beirut and Damascus. "The voluntary repatriation of around 850 Syrian refugees started" on Monday morning, Lebanon's state news agency NNA reported. Seven years into Syria's war, Lebanon hosts around 1.5 million Syrian refugees, compared with a local population of 4.5 million. Over the past few months, more than 800 Syrians have left Lebanon in similar operations organised by the governments of Beirut and Damascus. Several thousand have also independently left in recent years. 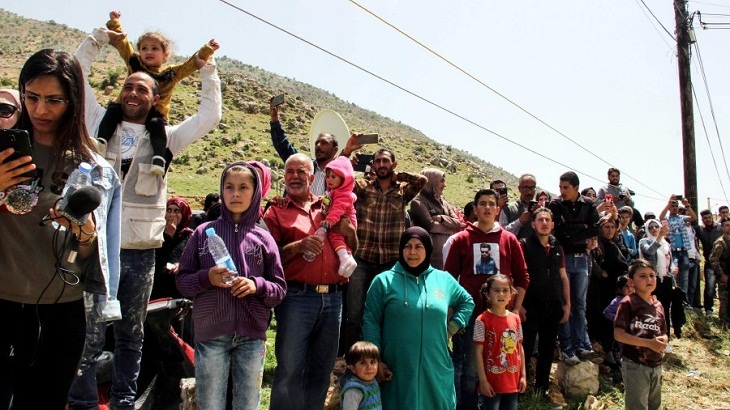 Syria's state news agency SANA said the first of "hundreds of Syrians coming from Lebanese territory" had arrived and were heading to Qalamun outside the capital. Syria's ally Russia has also put forward plans to the United States to cooperate for the safe return of refugees to Syria. Moscow has proposed the establishment of working groups in Lebanon and Jordan, to where many refugees have fled, a Russian defence ministry official said on Friday. An advisor to Lebanese Prime Minister Saad Hariri has met Russia's deputy foreign minister Mikhail Bogdanov to find out more about the initiative, the premier's office said on Saturday. The step would "help solve the refugees' crisis in Lebanon and put an end to their suffering and its social and economic repercussions on the host countries, mainly Lebanon," it said in English. Last month Lebanon's Hezbollah said the powerful movement was creating a mechanism to help Syrian refugees return home, in coordination with Lebanese authorities and Damascus.